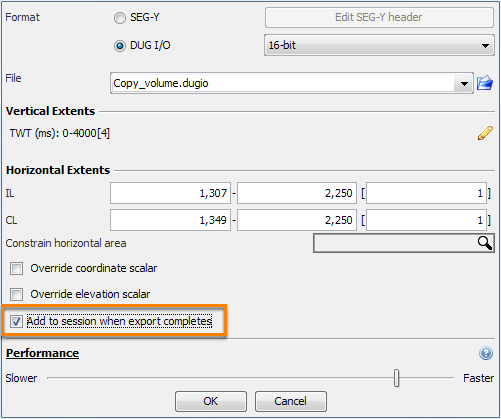 A copy of a volume can be created by exporting the volume and selecting the Add to session when export completes check box (see Exporting to DUG I/O). 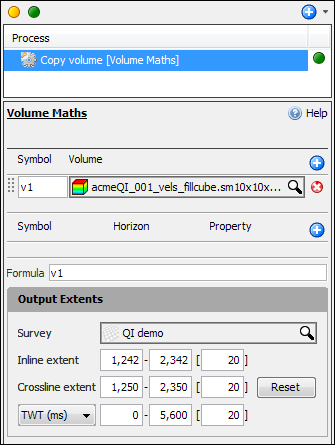 Some volumes require large numbers of calculations to display – usually complicated process volumes (see Processes Overview) or volumes with phase-rotation applied (see Manual Mistie Corrections). To boost the performance of these volumes, consider using the Export a copy approach. Alternatively, a volume can be duplicated using a process. This will create a disk-free process volume that is identical to the original volume. However, take note that volumes generated from processes may incur a performance penalty. Any mistie corrections on the original volume (see Manual Mistie Corrections) will be applied as the volume is exported. If this happens, the copied volume will have the corrections "baked-in" and will perform faster than the original volume (particularly for phase rotated volumes). The exported volume will be a complete duplicate. Hence, the phase, scale and shift parameters, and optimised sub-volumes will be separate from the original volume. Be sure to create optimised sub-volumes for best performance (see Optimising Volumes for Performance). Right click on the volume in the Volume tab and select Export. At Format, select DUG I/O. Click on the folder icon at File to name the file and save it to the desired location. Select the Add to session when export completes check box to automatically add the exported dugio volume to the Volume tab. Click OK to begin exporting. Note: For more detailed information, see Exporting to DUG I/O. Using a process will create a process volume that shares the original data on disk. Hence, the phase, scale and shift parameters are shared with the original. In the Details Panel, click the Add icon beside Volume and select the volume you want to copy. At Formula, type the symbol that is assigned to the volume to create a copy of the volume. At Output Extents, you can change the survey, extents and domain of the duplicate volume if necessary. Note: For more detailed information, see Volume Maths. As a result of this process, a new volume is available in the Volume tab. This new volume will be exactly the same as the original (unless Output Extents were changed).